If you have a) too many courgettes, b) one that got away and turned into a mini zeppelin or c) a partner who claims to hate summer squash, I may have the answer to your prayers. These bhajis are the business. On first bite my husband rated them ‘delicious’, downgraded to ‘quite nice’ when he remembered what was in them. Next time I won’t tell him. They’re quick to make and you don’t need a deep fat fryer. You will need gram, or besan, flour made from chickpeas and easily available in Asian stores. It gives the bhajis a lovely nutty taste. Coarsely grate the courgettes and onions into a large bowl. Add the chopped green chillis and garlic, the lemon juice and black onion seeds and stir well. Weight the gram flour into another bowl. Toast the cumin and coriander seeds in a dry pan until they smell fragrant, then grind to a powder. Add to the gram flour, along with the turmeric and salt. Stir with a fork to mix and to get any lumps out of the gram flour. Add the dry ingredients to the wet ingredients and stir thoroughly to coat all the strands of vegetable. Leave to one side and meanwhile put two centimetres of oil in a large deep frying pan on a medium heat. 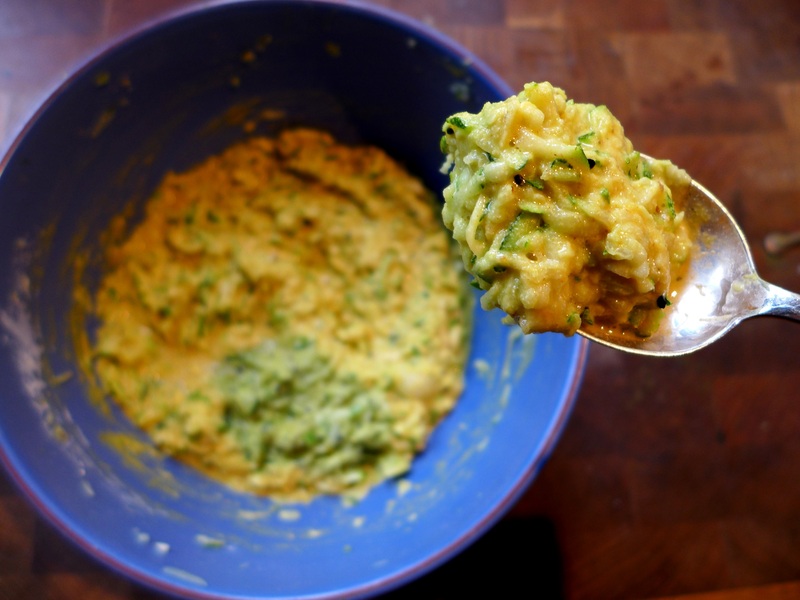 When it is hot, carefully drop tablespoons of the courgette mixture separately into the pan, spreading fairly thinly into a circular shape to form fritters. Cook on each side until a deep golden brown, then drain on kitchen paper and keep warm while you make the remainder. Serve hot with a minty yoghurt dip and maybe some chutneys on the side. 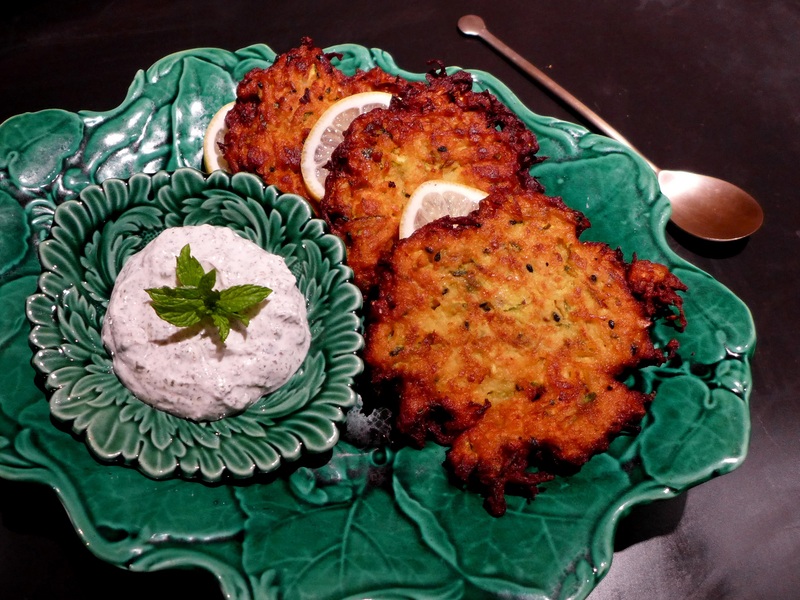 This entry was posted in Soups, starters and canapes, Vegetables and salads, Vegetarian and tagged courgette bhajis, spicy courgette fritters, spicy courgette rosti by Linda Duffin. Bookmark the permalink. Oh yes. It’s particularly good that you don’t have to deep fry them. I also will fail to mention the main ingredient when I make them. Not this week, or next. We’re off again. And soon, I’m going off to Spain for an intensive language course in Spanish. To help when we visit Emily in Catalunya. Hmmmmmm. That sounds exciting. Where are you going and or how long? Do you already speak some Spanish? Two weeks in mid-November, in Valencia. Then a quick sortie to Emily and Miquel in Barcelona – quite worried about things there, as you must be. Spanish? Well, I can get by in a bar or resto, and that’s about it. Valenica sounds like a good place to be in November. Enjoy! And yes, the Catalan situation very worrying. I love courgettes, so this recipe is a must for me! It looks so great! 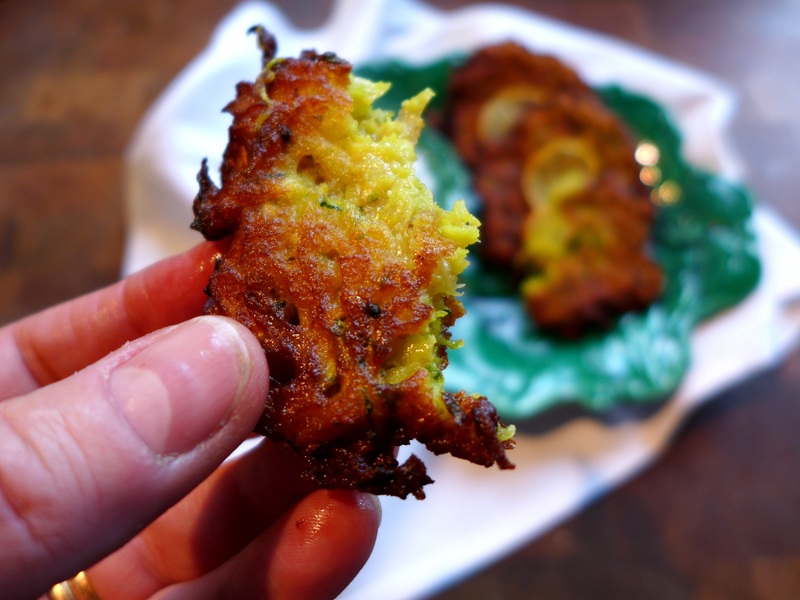 I make a batch of courgette/zucchini fritters most weeks. They are great for lunch and breakfast. My recipe has a Turkish twist, but you know I’ll be trying these, as I love the flavours of India. Thanks as always Linda. I will have to chase down this flour. I hope your niece is okay though she is likely out of the BVI if she is on boats. We head down on Tuesday. Seat belts fastened.